Dips can be a challenging and beneficial upper-body exercise, helping to strengthen the pectorals and triceps. Most gyms have some type of dip bar or parallel bars, but they're also a relatively inexpensive and simple thing to make at your own home. 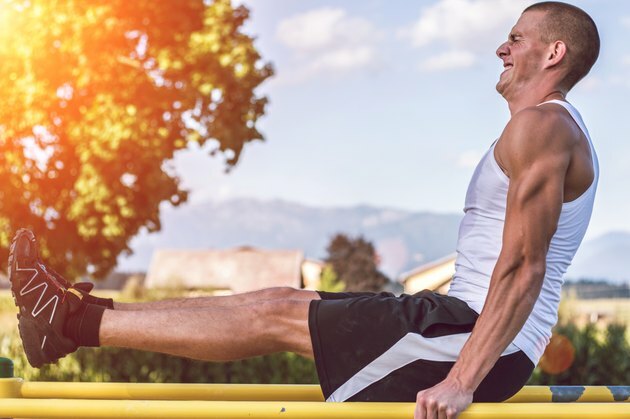 Your dip bars can be made with PVC piping or two-by-fours, but when you make them using four-by-four wooden posts and galvanized metal piping, your dip bar can double as a pullup bar or a hanging bar for hanging leg raises. For dips, the bars should be set at a width that is just slightly wider than the distance between your two shoulders. Measure the distance in inches between your two shoulders. Choose a location in your yard with at least 5 feet of open space lengthwise and 3 feet width-wise. Your structure will be 4 feet high; 4 feet, 8 inches long; and roughly 25 to 30 inches wide, but it's nice to have a little extra room on all sides. Lay a hose or rope or snap a chalk line around the area, creating a rectangle on the ground that is 4 feet, 8 inches long, with a width that corresponds to the width of your shoulders plus 6 inches. This will give you a feel for where the structure will stand. Dig your ﬁrst hole using your post-hole digger at one of the corners you've laid out. It should be 2 feet into the ground and 8 inches in diameter. Set your measuring tape to the length between your shoulders plus 6 inches. Lay the end of the measuring tape over the center of the ﬁrst hole and then extend the tape over to the other projected corner of the structure, which should be roughly 26 inches away. Make a mark on the ground where the tape ends; that is where the center of the second hole should be located. Dig the second hole with your post-hole digger. It should be 2 feet deep and 8 inches wide. Hold your measuring tape over the center of the ﬁrst hole and then extend the tape across the length of the projected structure's area. Make a mark at 4 feet, 8 inches from the center of the hole; this represents the center of the hole opposing the ﬁrst hole. Dig the third hole using your post-hole digger, creating a hole 2 feet deep and 8 inches wide. When that hole is dug, once again, extend the tape over to the last projected corner at a distance that represents the width of your shoulders plus 6 inches. Dig the ﬁnal hole to the same depth and width as the others. Set a post in one of the holes, making sure one of the post's ﬂat sides is facing the holes on the opposite side of the projected structure. Pour quick-set concrete into the hole to about 1 inch from the top and then ﬁll the remainder of the hole with water. Read the instructions on the concrete packet first, just in case the brand you've chosen requires a different method of mixing. Lay a level on the side of the post to ensure it is level; if not, adjust it until it is level. Then, nail two two-by-fours against opposing sides of the post, allowing the boards to rest on the ground, and brace the post in place as the concrete dries. Set another post into the hole closest to the ﬁrst, pour in the concrete and water and then brace the post with two-by-fours at you did the ﬁrst. Wait about one hour to allow the concrete to dry. Install the two posts on the opposite side of the projected structure as you did the ﬁrst. Carefully measure the distance between each post on one end of the structure and its corresponding post on the opposite end to make sure the distance between them is exactly 4 feet. If not, move them farther or closer together before the concrete dries around the second two posts. Use your drill to secure screws through each ﬂange and into the wood of each post. The ﬂanges should be set on the inside of each post, facing the post on the opposite end of the structure, about 1 inch from the top of each post. Secure both O-shaped ﬂanges to the posts on one side of the structure and both U-shaped ﬂanges to the posts on the opposite side, with the open end of the "U" facing up. Slide your 4-foot lengths of pipe into the O-shaped ﬂanges and then slide the opposite sides of the pipes into the open sides of the U-shaped ﬂanges, allowing the pipes to rest along the bottom lips of the ﬂanges. Once the pipes are in place, you're ready to use your dip bar. If more than one person wants to use the dip bar and you have a shoulder width that is very different than the other person's, you can create different widths on the two ends of the structure. Set the width between the center of the holes on one end of the structure to one person's shoulder width plus 6 inches and the width between the center of the holes on the opposite end to the other person's shoulder width plus 6 inches. When you put up the bars, they will not be exactly parallel, but it will allow you to do dips with bars that have a variety of distances between them.